Last month, I talked about the Shenmue 3 Kickstarter; I wanted to expand on my approach to questions like that. In general, the price of a product is somewhere between how much it costs to develop, produce and sell the product, and how much value people get from that product. This isn’t an immutable rule: there are plenty of companies that try to sell something and then discover that people aren’t willing to pay what that product costs – if a company makes a habit of that, they’ll go out of business. And there are situations when people buy a game and then decide that, in retrospect, that wasn’t a good use of their money. Still, that range is a good place to start. Dive down further and you find out how well something sells is determined as much by how many other options buyers have. If a product is a commodity, something with lots of options that are essentially identical (a gallon of milk or a box of nails), companies can’t compete on value. Instead, they’ll compete on price, driving it down. To further complicate the issue, the natural floor isn’t the overall cost to develop and produce the product: it’s just the cost to produce a copy of the product, ignoring the development cost. Once a company has figured out how to produce a given commodity, the development cost is a sunk cost. At that point, if Competitor A is selling for their marginal cost plus $5, competitor B can steal sales by selling for their marginal cost plus $4. So, what about games? The rise of digital distribution over the last decade has been a huge change for the industry and, with modern networks like PSN and Xbox Live, the marginal cost of producing another copy of a game that will be distributed digitally is effectively zero. This means that, to the extent that games are commodities, their natural price is $0. This is potentially devastating for game companies, but that hasn’t stopped it from happening. Games, however, aren’t always commodities: some are a lot more popular than others and it’s hard to tell in advance which will be popular enough to justify a price premium that would recoup development costs. This gives large studios an advantage. They can take a portfolio approach to average out the risk. This is why those studios prefer sequels to popular games – to reduce the expected variance. I suspect it’s also why, if we go back a decade, new games all cost about $60 even though they weren’t commodities, because that was one way that stores could amortize the risk of pricing games of unknown value. Then, as the value of those games become known, games that are less valued by buyers have their sales price correspondingly reduced; the used game market isn’t hampered by this uncertainty, so prices float earlier there. There’s nothing predetermined about the price of a product, at least in the non-commodity case. Sellers can find buyers for a product at a range of prices, but the higher the price, the fewer the buyers. Sellers want to maximize their profits, so they try to pick a price at which the number of buyers times the per-unit profit is highest. 1. Prices for products tend to fall in a range between its cost and value. 2. In a commodity market, prices are at the bottom end of the range, approaching the marginal cost of production. 3. While making a game, there’s quite a bit of uncertainty as to how much potential buyers will value that game. 4. Different potential buyers will value the same game differently. That second point plays out very differently now than a decade ago. Digital distribution means that the marginal cost of production is $0 in most cases; and the explosion of cheap computing devices mean that the potential target audience has increased by a billion people or more, which in turn increases the number of companies competing for the space, increasing the commoditization of the market. This is a recipe for companies being unable to recoup their production costs, unless they can do something to address these factors. As a result, we’ve seen huge changes on the business side of game production. Free to play games are a reflection of the zero marginal cost of production so, unsurprisingly, free-to-play games are everywhere. “Free to play” isn’t a business model, though, since it doesn’t explain how companies will survive in the face of that pricing choice. Ad-supported games are one way to make money: in a commodity market, players may not pay for the value of games, but advertisers see game-players as (just barely) valuable enough to pay for. As the saying goes: if you’re not paying for a product, then you are the product. This is embracing games as a commodity; in particular, you’ll see flash portals and ad networks promoting this, sites for whom games really are a commodity. 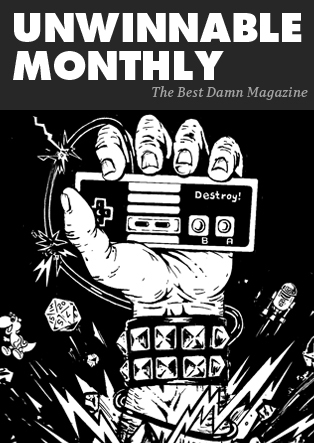 You’ve been reading an excerpt from Unwinnable Monthly Issue 55.